Florida has a thriving craft beer scene, and Alta Grande’s location puts you close to it all. 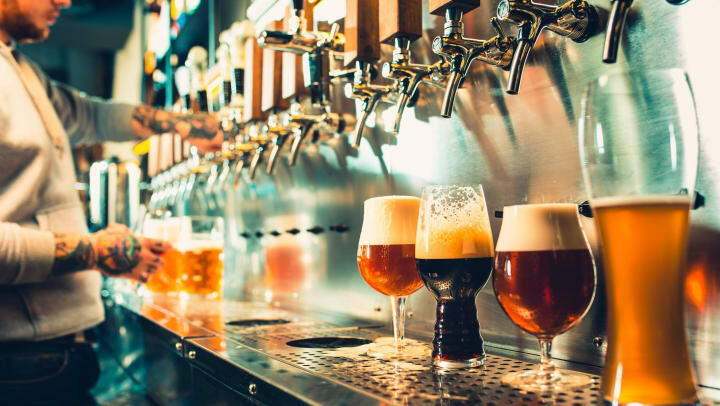 Whether you’re looking for a small bar with a big tap list or are in search of the perfect hazy IPA, you’ll be able to find it in South Florida. Take a look at our top five spots for sampling some of Florida’s best craft beer, all close to home at Alta Grande. If you’re looking for a place that has an over-the-top selection of beers, it’s no surprise that you’ll find it at House of Beer. Just over 3 miles from home at Alta Grande, this spot boasts 48 draft beer options, more than 250 bottled beers, entertainment, and a daily Hoppy Hour. House of Beer is locally owned and is proud to always have 10 taps dedicated to local breweries. Be sure to check out their events page for weekly fun and entertainment like their Big Boys and Lovely Ladies night on Thursdays. With roots in New Hampshire, this award-winning brewery focuses on top-fermenting English-style beers that have their own distinctive taste. In addition to great beers, Sea Dog Brewing Company is known for delicious pub food like its slow-roasted pork nachos and addictive pickle chips. People love this place, and there’s a reason why – they have a wide selection of craft beers on tap and in bottles and an awesome menu that ranges from pressed sandwiches to large salads. Started by three friends in 2012 to give people a local spot where they can relax with good beer, food, and company, this place is a hidden gem. Whether you’re going for brunch or just a quick brew with friends, you’ll love the relaxed Southern Florida vibes at Gnarly Barley. Ellipsis Brewing started with three friends and a 5-gallon homebrew system. They worked through recipes and found their love of craft beer, which created the foundation for the thriving brewery it is today. Located close to the Orlando International Airport, Ellipsis Brewing is a dog- and family-friendly brewery that is well-regarded for its IPAs. Head to their taproom, open seven days a week, for a welcoming environment and 15 different beers to sample. Who says you have to go out to have a good time? With an awesome home at Alta Grande, why not take the craft beer party home? Just over 3 miles from Alta Grande, you’ll find Knightly Spirits of Orange Blossom Trail, where there’s a world of international and domestic beers waiting to be explored. Choose your favorite beers or ones you’ve never heard of, and then get some friends together and host your very own craft beer tasting party.